The Irving Bible Church of Irving, Texas invited me to participate in two two-hour “We Engage” panels March 29, 2011 discussing 1 Corinthians 11:2-16 and 14:26-40. Professor Sandra Glahn of Dallas Theological Seminary and Dr. Alice Mathews of Gordon-Conwell Theological Seminary, also on the panel, gave excellent insights. The moderator, Jackie Roese, did a magnificent job adding humor and tying everything together. I loved the opportunity to provide satisfying answers to difficult questions. Everyone was respectful of the others’ views, and all the responses I heard were enthusiastically positive. All 51 copies of Man and Woman, One in Christ I provided sold out. One lady told me, “Until tonight, I hated Paul. Now I respect him.” You can listen to the audio of the panel in English at: http://www.irvingbible.org/media/all-audio/ and a Spanish translation of the panel at http://irvingbible.org/media/series/details/we-engage-panel-2011-spanish/. The next day I had a wonderful time seeing Bill Eubanks’, SMU’s, and Charles Ryrie’s Bible collections. Charles Ryrie and Bill Eubanks were fascinated by photographs of the eight distinctive distigme-obelos symbols at the precise locations of widely-recognized, multi-word interpolations in Codex Vaticanus B, including one at the exact point appropriate to mark 1 Corinthians 14:34-35 as an interpolation. Philip B. Payne and Paul Canart, “Distigmai Matching the Original Ink of Codex Vaticanus: Do they Mark the Location of Textual Variants?” pages 199-226 in Patrick Andrist, ed., Le manuscrit B de la Bible (Vaticanus graecus 1209): Introduction au fac-similé, Actes du Colloque de Genève (11 juin 2001), Contributions supplémentaires. Lausanne, Switzerland: Éditions du Zèbre, 2009, has been published and is available for free download at the above link or under this web site’s Publications : Articles page. This is probably the most important collection of essays on Codex Vaticanus B ever published. For a full description of this volume and a complete list of its essays see Le manuscrit B de la Bible (Vaticanus graecus 1209). It can be purchased at the discounted price of $49 from our secure on-line Order Form. Update: On March 22 I revised my Jan. 14 response to Peter Head, giving proof of the antiquity of distigmai. Thanks to Timothy A. E. Brown for recommending these revisions. Update: I have again revised this critique on March 27, 2010, correcting an error. Thanks to Brendan Payne for this observation. Update: I have again revised this critique on March 30, 2010, standardizing the spelling of obelus, metobelus, and hexaplaric. Thanks to Professor Keith Elliott for this recommendation. Update: I have again revised this Critique on March 31, 2010, including reference to Amphoux. Thanks to Professor Keith Elliott for this recommendation. Update: I have again revised this Critique on April 15, 2010, adding images of the marginalia and making it much more concise. What Demonstrates That 1 Cor 11:2-16 Refers To Practices In Assemblies Of Believers, Namely In The Church? I have written a response to Peter Head and updated it several times. The latest update is available in the March 17, 2010 post. To view the location, verse reference, and variant type of each of the 51 distigmai that match the apricot color of Codex Vaticanus’s original ink, click here. Question: Why not interpret 1 Cor 14:34-35 as a false prophecy that Paul refutes in 14:36-38? I received this question from Don Johnson, who is reading my book. Question: I am enjoying your book. I love your exposition of Eph 5. I have a question on 1 Cor 14. Before reading your book, I favored the idea that 1 Cor 14:34-35 is a quote from legalists at Corinth. The way I taught this is “the law/Torah says” is a ref. to the so-called Oral Torah of the Pharisees, which does limit women; and the 2 eta’s (sometimes translated as “or” but which I translate as “Bunk!”) in v. 36 which can be expletives of repudiation, per Nyland’s The Source New Testament (which she translates as “Utter Rubbish”) and others likewise. Nancy and I had many happy reunions with good friends at the annual meetings of the Evangelical Theological Society and the Society of Biblical Literature in New Orleans Nov. 17-23. Scores of people were absolutely delighted to be able at last to buy Man and Woman, One in Christ at the Linguist’s Software exhibits. 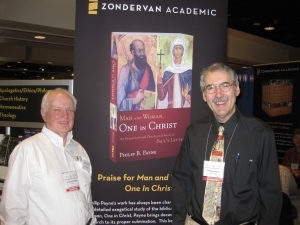 Zondervan had a huge eight foot tall banner/poster of my book where they sold many more of my book at their exhibits. Christians for Biblical Equality also sold many and displayed a poster of the book at their booth. A highlight at ETS was my presentation of a paper: “The Codex Vaticanus Distigmai as Evidence that 1 Cor 14:34-35 is an Interpolation.” The feedback was universally positive. I enjoyed seeing old friends at the Tyndale House (Cambridge, England) breakfast, the Gordon-Conwell breakfast and Sunday worship, the Zondervan author breakfast and lunch. I also had fascinating discussions at the Linguist’s Software booth, and enjoyed dinners with special friends. I will be at the ETS and SBL annual meetings in New Orleans in November. The Evangelical Theological Society Annual Meeting is Nov 18-20, and the Society of Biblical Literature Annual Meeting is Nov 21-24. At the ETS Annual Meeting I will read a paper on “Codex Vaticanus Distigmai as Evidence that 1 Cor 14:34-35 is an Interpolation” Thursday at 8:30 AM in the Waterbury Ballroom (2nd floor, Sheraton). At both meetings I will be selling signed copies of my new book Man and Woman, One in Christ: An Exegetical and Theological Study of Paul’s Letters, for only $14.99 (retail is $29.99). At ETS I will be at booth 617, and at SBL I will be at booth 440. Please drop by and see me. Question: Why would 1 Cor 14:34-35 be an interpolation? I received this question from someone who read about my book on the Zondervan Koinonia blog. Here I answer questions about my new book "Man and Woman, One in Christ" and provide its complete Bibliography and Supplemental Studies. I welcome questions regarding my new book. See endorsements for my new book.